COLLEGE STATION, Texas— Loyalty, respect, and selfless service are some of the core values that are taught at Texas A&M University. And, the four-legged Aggies with the A&M Corps of Cadets Parson’s Mounted Cavalry are also demonstrating those values through a program called Courtney Cares. The horses are helping to build champions—through healing. Caleb Autry was afraid to ride a horse before he came to Courtney Cares. “I was scared,” said Autry. “But that was a long time ago,” he added. Autry began riding a Cavalry horse named Grant three years ago—and Grant helped him overcome his fears. 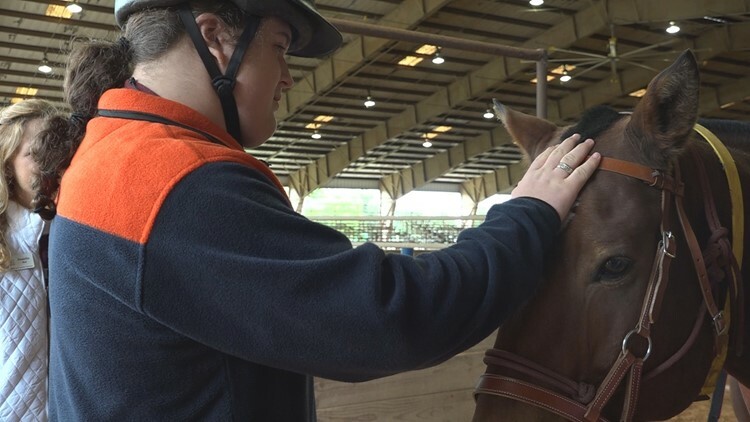 Courtney Cares is an equine-assisted therapy program that works with children and adults with special needs. Cadet Mary Norrell is a member of the Cavalry and dedicates her time to working with the kids through Courtney Cares. “It’s definitely a unique experience just watching how the horses react differently with different people, especially the younger kids,” said Norrell. And, she said those interactions are life-changing. “When they finally get something they haven’t been able to get before, it’s something that really celebrated,” said Norrell. Norrell said the equine-assisted activities through Courtney Cares help to build functional life skills for participants. “The horses walk more like we do, so if they’re up on top of a horse, it’s moving their hips the same way it would as if they’re walking,” she said. It’s a unique way for the kids to improve their balance, flexibility, and muscle strength. Norrell said that a few children in the program couldn’t walk on their own when they started the program, but now they’re able to walk short distances. “They were not able to do those things when they first get here, and so when they finally are, that’s a big step for them,” said Norrell. Courtney Cares began from the vision of the program’s namesake, Courtney Anne Grimshaw Fowler. Grimshaw Fowler was planning on creating an equine therapy program when she passed away. In 2011, her brother reached out to Texas A&M about starting a program in her honor. And, in 2012 Courtney Cares was born. Courtney Care is run by volunteers mostly from the Corps of Cadets, and the Texas A&M College of Veterinary Medicine who manages the program. Jay Branum said his son, Wyatt, has made great strides since starting the program. “It’s pretty amazing that these horses can do what they do for the cavalry and then come out here and be as gentle as they are with these kids,” said Branum. In Courtney Cares, animals and humans connect, and achieve the impossible—all because of the healing power of gentle giants. “I’m convinced these horses understand what their role is out here,” said Branum. Courtney Cares is hoping to raise their endowment funds to ensure the program can run for many years to come. If you’d like to make a donation, or learn more about Courtney Cares, follow this link.